Just add water and each white package yields one mug (10-11 oz.) of delicious instant hot chocolate. Best for 500 - 5000 pcs. Packed 72 pieces per case. Minimum order without labels is 288 pieces (4 cases). 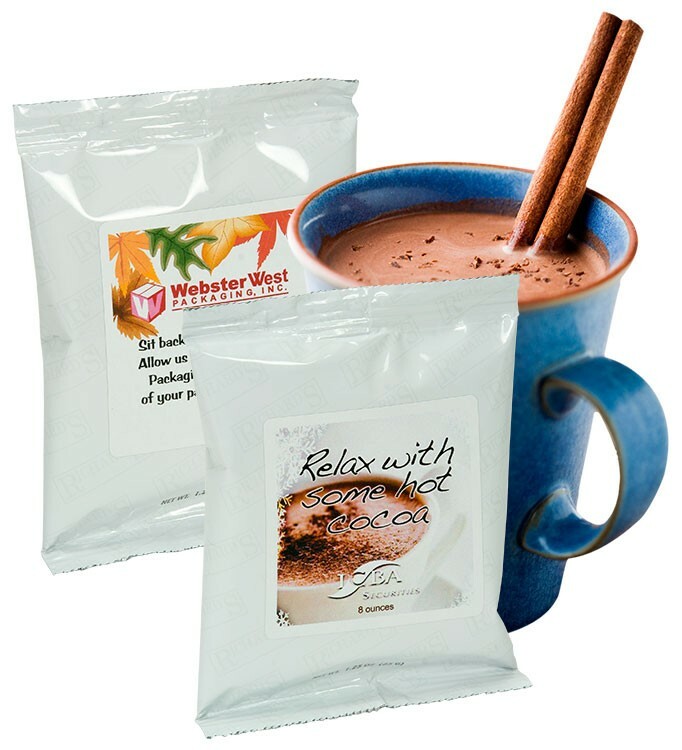 Perfect for single serve hot chocolate, dutch cocoa, cocoa, pouch, instant cocoa, drinking chocolate, hot chocolate mix, hot cocoa, chocolate drink, holiday cocoa, individual cocoa, logo, corporate gifts, hot chocolate gift, client gift, corporate gift hot chocolate, single serving, holiday cocoa, trade show give-away, conference giveaway or a DC1 mug stuffer. Imprint Area: 2 1/4" x 2 1/4". Full bleeds are not available. Repeat label charge: $27.50 (G). Printed 4CP on white label. Heavy coverage is not available.